Europe has been struggling recently with political and economic uncertainties arising from all corners of the continent. While bad news may be present for some industries, venture capital is not one of them, judging by its 2018 performance. For the first time ever, VC funding in Europe surpassed €20 billion, driven by swelling deal sizes and valuations. This is despite a dramatic drop in the number of transactions—some 25.9% YoY—taking place on the continent, particularly in the earliest stages as VC investors feel the pressure of larger check sizes. The 2018 European Venture Report dives into VC datasets for deals, exits and fundraising to look at all the issues that affect the current landscape. Below are nine charts that illustrate the state of European VC. Unlike previous years, 2018's uptick in deal size wasn't driven by a few blockbuster transactions, but rather a surge in capital invested across all types of transactions. This resulted in less capital concentration in the upper range. Compared with the previous year, 2018 had a very similar count of deals over €100 million; however, they contributed only €2.8 billion in value, compared with €4.3 billion in 2017. Perhaps one of the factors driving the higher deal prices is the elevated valuations among US startups, which is leading investors from across the pond to seek out more attractive assets in Europe. The proportion of US firms taking part in European deals reached 20.9% last year, well above the past decade’s range of 11% to 14%. 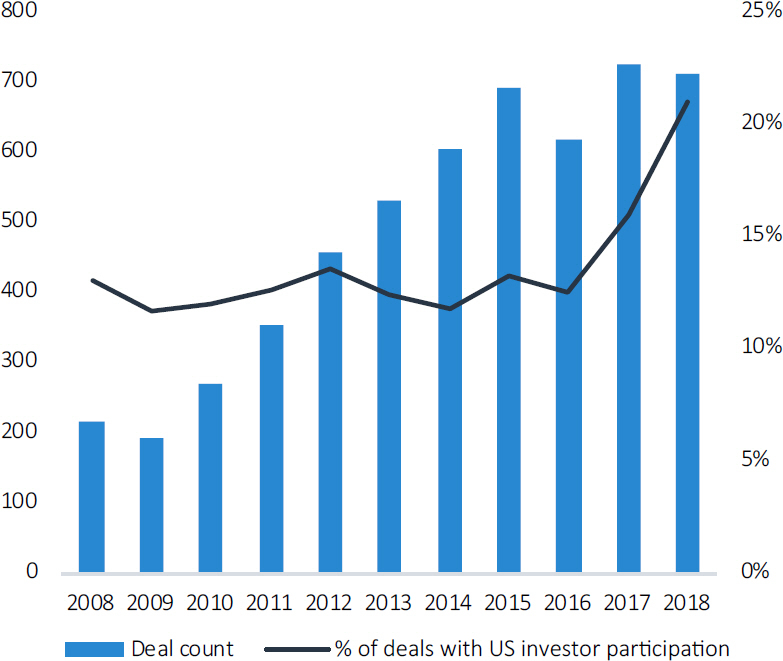 Alongside US investors, corporate venture capital's presence in European deals increased in bigger rounds, making them increasingly important sources of capital for startups. While corporate investors participated in fewer deals last year than in the previous two years—reflecting the global trend of diminishing deal counts in the venture capital industry—CVCs made their existence known by throwing a record amount of capital at European startups. More than a fifth of European deals included a corporate investor, particularly in the €10 million to €25 million bucket where CVC participation was up 23.9% compared to 2017. However, corporate investors were rarely present in smaller deals, recording a 25.8% decline in angel and seed rounds, and a 19.1% decrease in early-stage deals from 2017. 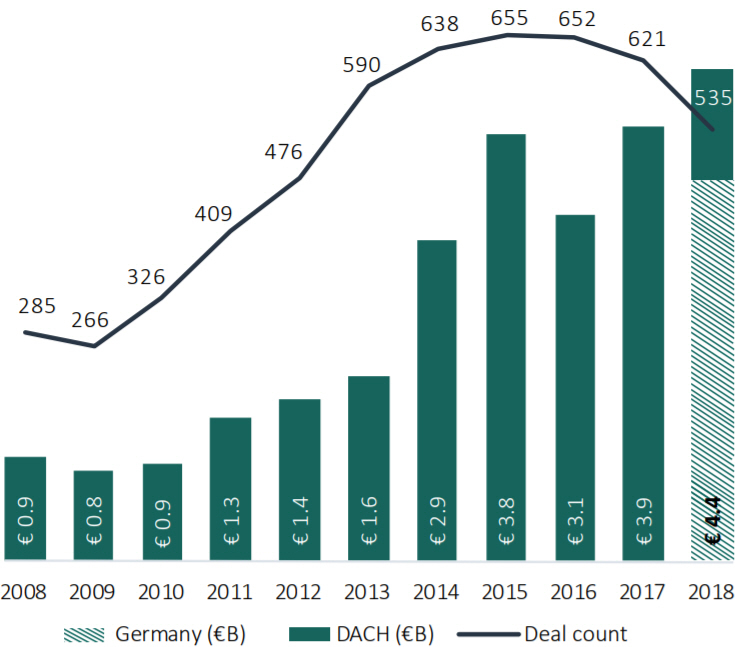 While the UK and Ireland are still in pole position in the venture capital industry in Europe, the DACH region recorded the strongest relative growth in deal activity in 2018, making up 15.8% of all transactions. The area saw a record amount of funding, due mostly to more late-stage rounds, particularly in Germany, pointing to a healthy and mature ecosystem. Germany is not only leading the way for startups in the DACH region, but also for VC investors. Firms hailing from the country closed nine funds in 2018, totaling 85% of all capital raised in the area. Having secured around €1.6 billion in commitments, Germany comes in third in the continent, behind the UK and France. 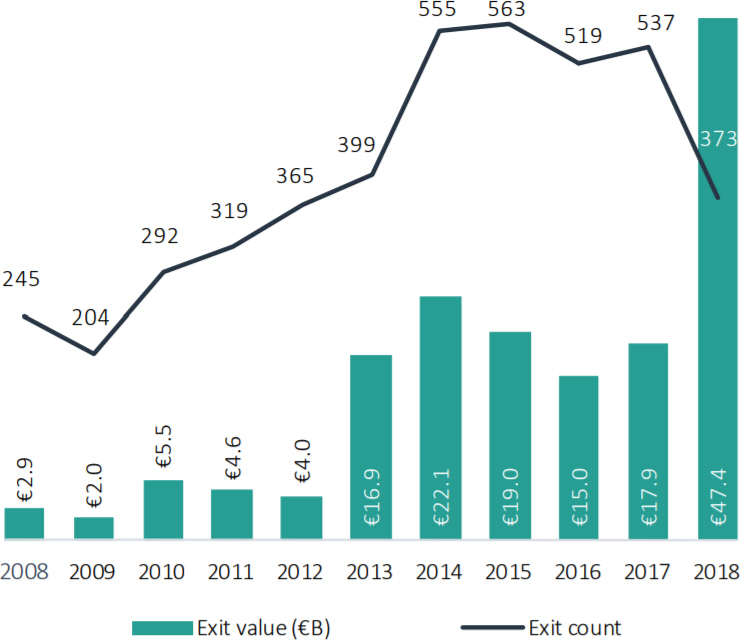 It might be forgiven at first glance to be amazed at the value of European exits in 2018, which soared to €47.4 billion. However, taking away the continent's two most high-profile listings—those of Spotify and Adyen, which are worth a combined €30.3 billion—the reality is much more subdued. Contrary to deal activity, fundraising in year over the past year paints a bleak picture. The number of closed VC funds fell to its lowest level in a decade to stand at 62, a 43.1% decline from five years ago. The value of these vehicles has remained stable compared with 2017 but is a far cry from the levels seen in 2015. The fall in VC vehicles has created a concentration of funds in the hands of a dwindling number of investors with a lot of cash. 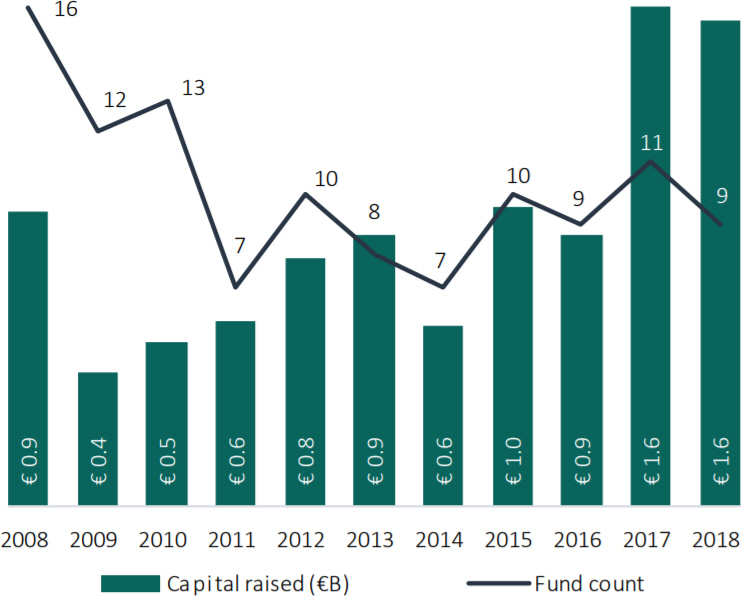 While the number grows smaller, the size of these vehicles is expanding; the median fund size reached an all-time high of €123.2 million in 2018, a 59.3% rise from the previous year. This is less good news for smaller startups, which would not be seeking the check sizes delivered by a €500 million fund, limiting their access to capital.